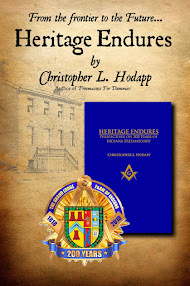 I am so gratified at the reception the book has received and so honored that the GM and the GL felt it was important or good enough for every Master to take home a copy to his lodge. I had honestly intended to attend the Founder's Day session to see and hear the program, and instead would up in the lobby signing books all day. Hundreds of them. The great part was seeing so many brothers face to face. The bad part was that I missed what so many are calling the best Founder's Day program in years. BTW, thanks also to the brethren who stopped to pass along their compliments over the York Rite video I put together that was running down continuously by WT&Ts shop. Kudos to MWBro. Denny Herrell and his officers for a great day. And thanks again to everyone who stopped by the table and chatted. Valley Lodge #459 - The Dummies Tour Begins! 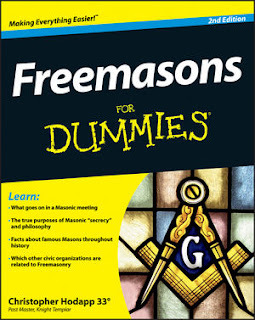 My first speaking engagement on the Freemasons For Dummies tour - Valley Lodge No. 459 in, appropriately enough, Masontown, Pennsylvania on Janury 5th, 2006. (LtoR)Some dwarfish Dummy, Wbro. Jason Craig, MWBro. Frank Joseph Haas, GM of West Virginia, and Junior Grand Deacon R. Jay Guminey, also of the GL of West Virginia. I was gratified and humbled by the overwhelming hospitality shown to me by the members of Valley Lodge and the many visitors from both Pennsylvania and West Virginia. Getting to sit in lodge with the Grand Master of West Virginia, MWBro. Frank Haas, was an added bonus I never expected. Wbro. Jason did an outstanding job as Master for his first Stated Meeting. His calm and proficient leadership was much appreciated by even the most seasoned sideliners. Valley Lodge is going to have a terrific year. And with the creation of a strategic planning committee last night, his successes will continue. Bravo on an excellent night. Thanks again to all of the Masons there for a great evening, one I shall always remember. The Pennsylvania ritual is similar yet very different from Indiana's - and indeed from most of the rest of the United States. Pennsylvania still works a ritual based on the English Antient's form, prior to the 1813 UGLE reunification. It is NOT based at all on Preston-Webb the way the other 49 states and Washington DC are. One feature that I found particularly strange was that the Worshipful Master stands for the entire opening. But even that is misleading. The officer's duties are rehearsed in the MM opening as we do only when we open on the EA. And when the Secretary gets to his part, he doesn't just recite his duties, he then reads the minutes of previous meetings at that time, again while the Master remains standing. I'd venture to say Jason stood for almost 45 minutes before he was allowed to be seated. The optional opening and closing charges in the Indiana Monitor are NOT optional in Pennsylvania, they are part of the opening and closing. There are three additional officers immediately in front of the SW station: a Pursuivant, and a Junior and Senior Master of Ceremonies, all armed with swords. Pennsylvania Grand Lodge REQUIRES all officers to be in tuxedos, with very specific, official design (tails, no wing collars, bow ties). Requires. Period. That goes for white gloves, too. They are actually planning a road trip to Indiana in April, to exemplify the Master Mason degree using PA ritual, at Howard lodge in Kokomo. Like I say, I expect great things will happen in their lodge this year, and beyond. My apologies to Jason's bride for keeping him out so late. "Sorry Brother, but you're keeping Broad Ripple lodge hours now!"